Karen, when did you first realise you wanted to be an artist? I’ve loved to draw and paint for as long as I can remember, I know that sounds trite but it’s true. I’ve always enjoyed the process of developing something from just a scrap of an idea to a fully realised piece, be it a drawing, painting, sculpture or piece of jewellery. There was never really a question of me doing anything else; I knew I would end up as an artist of some kind or another. What art or artist do you most identify with? A lot of the artists and illustrators whose work I love are from around the late nineteenth and early twentieth centuries. Kay Nielsen, Harry Clarke, Ivan Bilibin, Edmund Dulac and Arthur Rackham are some of my favourite illustrators. Their work is at once beautiful and bizarre, full of intricate detail and incredible line work. I’m definitely inspired by those artists but I try to approach my work in a slightly more contemporary way. Besides that, I’ve always had a soft spot for Art Nouveau artwork, architecture and decorative art, which I think comes through more so in my illustrations than my design work. I see that literature, fables and stories, are apparent in your work but is there anything else which inspires your art? Nature is a huge inspiration for me, I find that organic forms and motifs inevitably find their way into my illustrations and it’s not always a conscious thing. How did your art lead to designing covers? Well, it’s all quite new to be honest. I’ve just recently finished a degree in Illustration at the North Wales School of Art & Design and after graduation I spent a few months exhibiting my work and doing commissions. 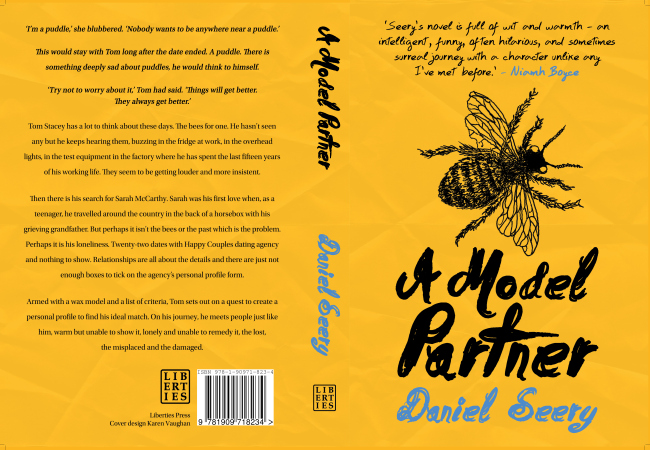 In November, I applied for an internship at Liberties Press, which is how I ended up designing the cover for A Model Partner! (Tough question!) Do you have a favourite book cover? Oh, I couldn’t pick just one favourite! However, I can list some designers whose work I love. In no particular order: John Gall, Coralie Bickford-Smith, Ray Fenwick, Carol Devine Carson and Oliver Munday are all wonderful designers. What advice would you have for anyone who would like to get into this area? I think the most important thing is to keep consistently producing work and sharing it online. Twitter, Tumblr and Behance are pretty invaluable resources for promoting your work and it’s how I’ve gotten most of my work so far. Making contacts in any industry you plan on getting into is also a good move, it can lead to group projects, exhibitions etc. Hopefully more of the same really, I love what I’m doing at the moment so if I can keep building on that I’ll be happy.I did specialise in illustration for children’s books though, so if I got the chance to design and fully illustrate a children’s book, that would be the ideal project for me.